This 140 page accompaniment to the 2011 World Cup is a fascinating collection of everything which the cricket fan could hope for. The style might not be to everyone’s taste – there are a lot of exclamation marks – but the book rapidly grew on me and I found myself intrigued by many of the interesting facts and statistics. The book starts with a potted history of international cricket ( Tests, ODIs, Twenty20 ) and charts many of India’s historic matches in the World Cup and other ODI tournaments. There are interesting profiles on India’s players with not only relevant averages and career details but a trivia section and the space devoted to each player should be ideal for anyone wanting to learn about the Indian players. Sachin Tendulkar features prominently with articles on what other great players think of him, some of his memorable innings , some records which he could break during the World Cup and a few obscure facts about Sachin. There are sections on how each team might fare and a schedule of the matches with spaces for scores and the winners which can be completed at the end of the match. Another chapter details a brief history of the previous nine World Cup tournaments since 1975 and there are also sections on commentators who will have been seen on various TV channels and interesting trivia facts. 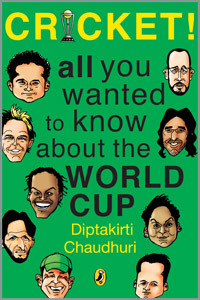 Diptakirti Chaudhari has done an admirable amount of research in this very enjoyable book and it will give readers of the game much pleasure and is very well worth the price of Rs199 available in India.